Kit & Kin is the sustainable nappy with premium performance. 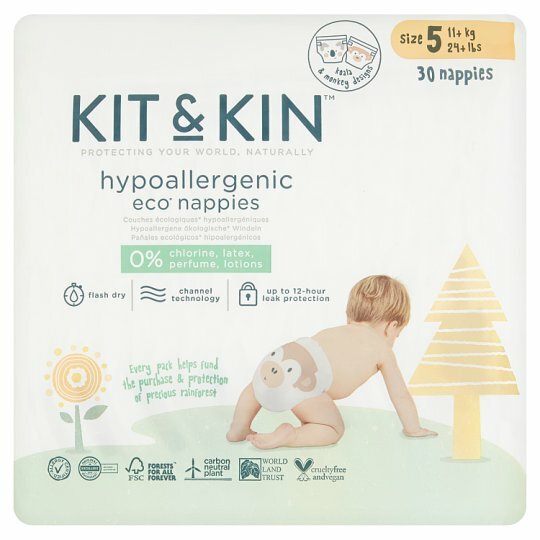 Made with naturally derived plant based materials and featuring a part-natural high-tech absorbent core, Kit & Kin nappies contain significantly fewer chemicals than standard nappies and help protect your baby's delicate skin and safeguard it from sensitive skin problems like eczema and nappy rash. - 25% of all medications used around the world originated from the rainforest, yet only 1% of the rainforest has been analysed for its medicinal benefits. - At the current rate of deforestation, the rainforest will be gone in just 40 years. We use sustainable materials to help end our dependency on non renewable resources and protect the future resources of your baby's world. - Our soft internal and outer linings are made with naturally derived, plant-based sustainable materials. - Our super absorbent core contains chlorine-free fluff pulp harvested from sustainably managed forests. - Our front panels, tapes, anti-leak barriers and packaging are all made from an oxo-biodegradable material. - Our soft waist and elastic stretch panels naturally adjust to your baby's body shape for greater freedom of movement. - Because we use fewer chemicals than standard nappies, your baby will only come into contact with the softest and most gentle materials. Kit & Kin is proud to be a member of PETA, People for the Ethical Treatment of Animals. By purchasing cruelty-free products you can help save a number of animals from excruciating tests and a lifetime of suffering.